Welcome to Michigan Backcountry Search and Rescue's (MiBSAR's) investigative Web site in support of the FBI's investigation into the March 29, 2011, unsolved bank robbery at the Superior Iron Range Community Federal Credit Union (SIRCFCU) in Iron River, Michigan. Early on the morning of Tuesday, March 29, 2011, a male subject entered the Superior Iron Range Community Federal Credit Union (SIRCFCU) in Iron River, Michigan. Once inside, he walked up to a teller window, brandished a handgun, and demanded cash from the female teller. FDIC insured, the SIRCFCU has four community-based credit union offices serving individuals, businesses, and organizations residing, working, conducting business, attending school, or worshiping in Marquette, Iron, Alger, Dickinson, and/or Baraga county. The subject fled the area on an ATV with an unknown amount of cash. of Michigan's Iron County, click here. Witness descriptions and bank video-camera footage indicate the suspect was a 5-foot, 9-inch-tall, 175-pound, white male with blue eyes. 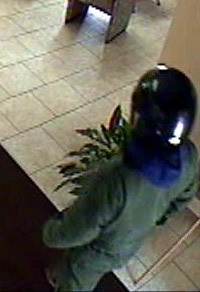 Witness descriptions and bank video-camera footage indicate the suspect was wearing a dark-colored, full-face-style helmet with a visor. A large, white-colored, horizontally-running logo spanned the width of the front, forehead area of the helmet, just above the visor. A small, white-colored, oval-shaped logo was located on the back of the helmet, near the bottom. Witness descriptions and bank video-camera footage indicate the suspect was wearing a pair of green-colored coveralls with a heavy-duty, metal, chest zipper; multiple pockets (including a slash-style chest pocket); and knee-length leg zippers. Witness descriptions and bank video-camera footage indicate the suspect was wearing a blue-colored hoodiea jacket with a hoodunderneath his coveralls, with the hood exposed, and draped down his upper back. Witness descriptions and bank video-camera footage indicate the suspect was wearing a pair of heavy-duty, lace-up boots with tan-colored rubber soles and leather uppers. Witness descriptions and bank video-camera footage indicate the suspect was reportedly armed with a black, long-barreled, semi-auto pistol. Witness descriptions indicate the suspect reportedly fled the scene in a northwesterly direction on a green-colored, four-wheel ATV. A multi-agency task force led by Special Agents from the Marquette Office of the Federal Bureau of Investigation (FBI) continues to aggressively investigate this bank robbery. A reward of up to $2,000 is being offered by Crime Stoppers and the Superior Iron Range Community Federal Credit Union (SIRCFCU) for information regarding this investigation. If you know the identity of the subject who committed this bank robbery, or have any information regarding this investigation, please contact the FBI directly at 1-906-226-2058, or call Crime Stoppers' anonymous, toll-free tip line at 1-800-222-8477. Anonymous tips can also be submitted digitally via Crime Stoppers' anonymous E-tips Web page. Note: If you're still concerned about maintaining your anonymity in this technological age, please consider reporting your tip from a public telephone, or perhaps a computer at a local library.